Aspiring business leaders may find that taking a course in biology will serve their companies better than focusing on the standard business curriculum. That’s because successful organizations today are more like a complex adaptive system found in nature and less like hierarchical organizations with military-like command and control structures that past generations of leaders managed. Systems in nature are made up of highly interconnected and interdependent parts to adjust and adapt as conditions change in order to survive. They cope with unpredictable phenomena by getting feedback from their environment and then changing to meet the new conditions they face. Progressive leaders in today’s dramatically changed business climate are looking to nature as they seek to deal with complexity in new ways and create more adaptive, resilient and engaged organizations. The risks and rewards inherent in times of change are well known to senior leaders, who have to seize opportunities for growth while sidestepping pitfalls. But there’s a big difference between being aware of a complex, rapidly evolving business landscape and taking successful action to leverage it—especially when the ground beneath them seems to be constantly shifting. As leaders seek new ways to help their organizations become more agile, many of them have not yet understood or embraced the new biology of their organizations, or considered leading it in fundamentally different ways. And many have not yet recognized that one of the “agents” in their complex adaptive system is the physical workplace, which can be used to help shape new, agile behaviors—or reinforce the ways things have always been done, slowing adoption and hampering organizational resilience. Progressive leaders in today’s dramatically changed business climate are looking to nature as they seek to deal with complexity. 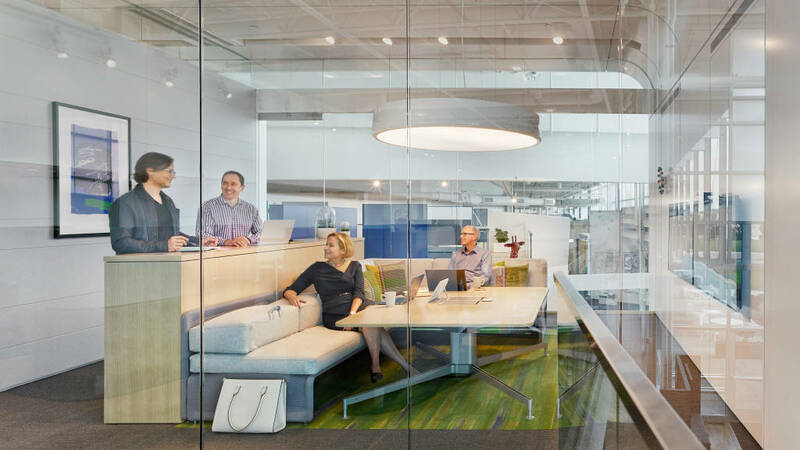 For over 20 years Steelcase has researched the changing nature of work, including the disruptive elements impacting leaders, using its own leadership spaces as a laboratory. Designed as prototypes to test theories and push the boundaries of how work happens, these spaces have resulted in radically re-imagined ways of working and leading, both as individuals and as a team of leaders. 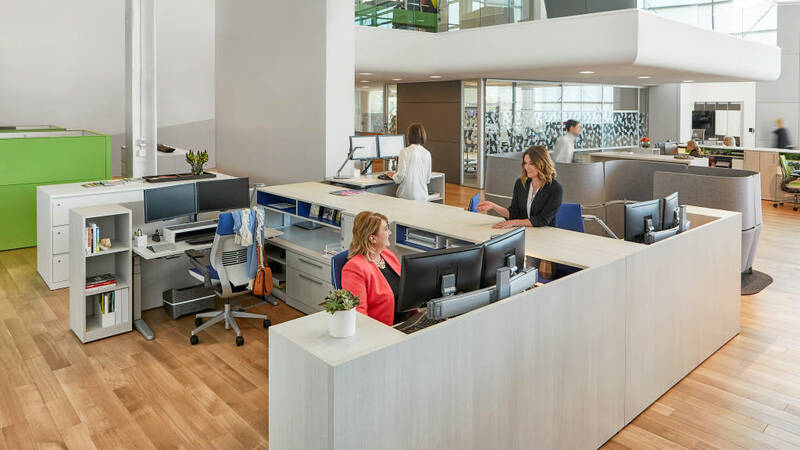 The latest research has identified how physical space can help executives lead their organizations like a complex adaptive system and, in turn, reshape the culture and organizational performance overall. The latest IBM C-suite study dubs today’s increasingly complex business environment as “the age of disruption,” in which it’s difficult to predict what’s coming next, or where it’s coming from. CXOs around the world point to the threat posed by “digital giants” flexing their technology muscle in new industries, supplanting known competitors, and “ankle-biters,” agile startups that seem to come out of nowhere and redefine the market. Today leaders also have to navigate a globally interdependent ecosystem to a far greater degree than their predecessors. While this deep global reach has created greater opportunities, it also exposes organizations to a complicated web of laws, languages, customs, regulations, cultures and other market realities. 34% of employees are engaged. 37% of employees are disengaged and simply doing enough to get by. 29% of employees are wavering between engagement and disengagement. This new global landscape requires organizations to quickly pursue new ideas and opportunities, but to do this employees must act as resilient, agile “agents” in a complex adaptive system: interacting, learning, adapting and responding to change. Yet leaders face a major barrier – a workforce in which the largest employee segment, 37 percent, is disengaged, simply doing enough work to get by, according to a two-year study by Steelcase and global research firm Ipsos, “Engagement and the Global Workplace” (to learn more about the key findings in this study visit www.steelcase.com/globalreport). Today’s leaders must navigate a complex global landscape that exposes organizations to a complicated web of laws, languages, customs, regulations and cultures. But there is good news: 34 percent of employees are engaged and want to work in new ways, seeking meaningful work and workplaces that enable them to make meaningful connections. And the 29 percent of employees wavering between engagement and disengagement can be within reach for leaders who take proactive steps to address what employees really want and need in their work experiences. Leaders need to manage large numbers of internal and external relationships that span organizational and geographic boundaries. It not only requires an ongoing juggling act, but also amplifies the degree of mobility required to lead an organization today. Kammer and a team of Steelcase researchers and designers interviewed and observed work behaviors of executives over the course of two years to understand the challenges they encounter and how they need to work differently. They saw that executives are facing the same onslaught of information that most employees are experiencing—only more. Leaders are coping with “infobesity” and need to quickly winnow out extraneous data to find information of value. Leaders can’t rely on information making its way up the chain of command and yet know that they can’t fall into the trap of trying to know everything themselves, so they need to rely on their expert networks, internally and externally. Dealing with information that is often sensitive or confidential causes a balancing act for leaders who also need to be accessible and visible. The Steelcase researchers also noticed that the breadth of the work leaders are doing results in rapid context shifting, requiring a mental reset for each new meeting that fills their jammed schedule. The pace of work has accelerated for everyone, and for global executives who are in constant demand, schedules have become even more fragmented and extended to span multiple time zones. Leaders need to manage large numbers of internal and external relationships that span organizational and geographic boundaries. It not only requires an ongoing juggling act, but also amplifies the degree of mobility required to lead an organization today. Being “on” and available to more audiences creates additional pressures on them. “Meeting with everyone who wants to see me is impossible. I want to be accessible, but there are not enough hours in the day,” according to one executive. “You can get hijacked by email,” said another. All that mobility, timezone hopping and schedule juggling takes its toll. Although today’s highly nomadic leaders frequently say they can work anywhere, doing so can actually undermine their reasons for doing it: Instead of gaining energy, insights and inspiration from others, they risk becoming cognitively overburdened as they strive to heroically work longer and harder. Some of the first things that get sacrificed are the activities leaders need to rejuvenate and gain the physical and mental stamina required to do their jobs. “It’s really all about managing your energy: physiological, emotional, mental and spiritual—that whole realm of purpose, meaning and motivation,” said one executive. Another frequent casualty is the loss of connection with people—not only with their employees, but with their executive peer group. Without these interactions, leaders can’t develop a panoramic perspective and broad organizational intelligence. Rather than working collaboratively as a leadership team, they risk inadvertently working at cross-purposes. While everything seems to be changing around leaders, either by choice or circumstance, one thing that is fairly enduring are their offices. The vast majority of leaders work in traditional, private offices according to the Steelcase Global Report; 58 percent work in private offices compared to 23 percent of employees. While that disparity is probably not surprising to most, it begs the question of whether leaders have considered the possibility that their workspace could be a catalyst for the type of change they are trying to implement. While grouping leaders in aisles of executive offices with administrative assistants on guard or creating executive dining rooms can bring leaders in closer proximity to one another, it can also separate them from what’s really happening in their organizations. Employees worry about disrupting busy executives and often feel uncomfortable or even unwelcome in these leadership offices. While executive suites are still the norm, leaders are spending more time working anywhere and everywhere, knowing they can’t afford to be isolated from employees who have their fingers on the pulse of the organization. They’re seeking ways to be more in touch with what’s really happening. To make a clear statement, one executive said he replaced opaque walls in his office with glass. “I want people to see me working with lots of different people, I want our work to be exposed,” he explained. The vast majority of leaders work in private offices, according to the Steelcase Global Report; 58% work in private offices compared to 23% of employees. Another CEO who participated in the study intentionally moved out of the traditional, 300-square-foot office that he inherited to a smaller office on a lower floor. “It was symbolic for me to come downstairs, I’m trying to break down the hierarchy,” he explained. “Too much decision making has been going down the chain of command. That’s not the best way to run a business. I don’t have all the knowledge that other employees have to make the decision, and it slows us down. In this ever-changing business environment, top executives are rethinking how to lead and create more robust organizations. By understanding business as a complex adaptive system, organizations can foster resilience and thrive in the midst of unpredictable circumstances. The model of adaptive systems provides insights for how to deploy key resources, especially people, in fundamentally different ways. One of the most radical shifts is recognizing that adaptive systems are distinguished by distributed decision making, rather than central control. In this environment, people are not part of a rigid system, waiting for direction from people above them in the chain of command. Rather, they need to rapidly and continually adjust in response to the feedback they receive in order to thrive in dramatically changed circumstances. Unlike more rigid systems, adaptive ones rely on a regular flow of feedback from their larger environment to help them respond and change. Even the military, which has functioned for centuries under a command and control hierarchy, is reconsidering how to morph into a more adaptive system. 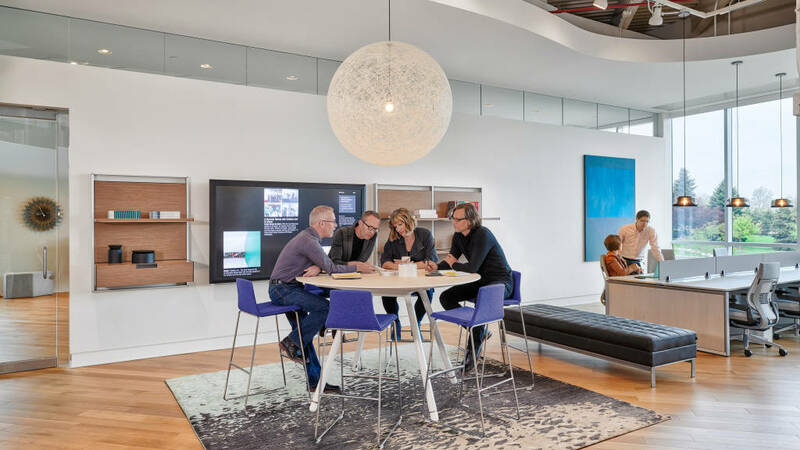 To gain a deeper understanding and test emerging concepts, last year Steelcase researchers and designers began working with the company’s executive team to envision the next evolution of leadership spaces and to test that plan in a new Leadership Community. The team has trialed new concepts for its executive spaces for over 20 years, making the radical shift in 1995 from private executive suites on the top floor to an open-plan space on a more accessible floor. Two iterations later the team recognized it was time to explore new territory. “Space is the body language of an organization,” says Julie Barnhart-Hoffman, design principal, WorkSpace Futures. “It’s a way to communicate and a way to provoke desired responses.” Executives may not have thought about what their space is communicating to the organization, potential employees, outside partners, investors or other stakeholders. But it’s clear that in some organizations there is a disconnect between the words they use to communicate their desired culture and the message that their space is sending. There is a link between physical health, mental health and cognitive performance. Executives need to manage significant stress from the performance pressures they face. Environments that help executives manage stress and promote their wellbeing can enhance their cognitive processes. Executives face even greater challenges in maintaining relationships and informational connections, especially in globally integrated organizations. Leadership spaces can be designed to help facilitate better connections between people and information, while providing remote executives with a virtual presence more similar to the experience of leaders who are physically present in the space. Executives are challenged with the need to constantly switch informational contexts through-out the day. Time is also a critical resource. 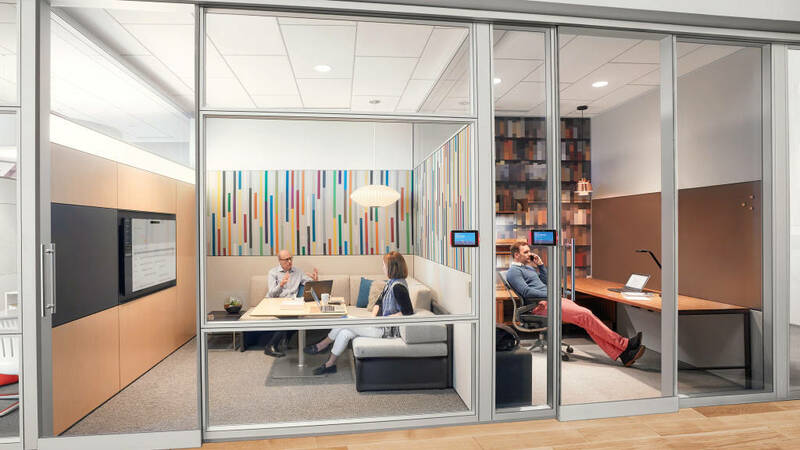 Physical spaces can help accelerate contextual immersion and support leaders getting into flow faster. A key decision was to continue the executive team journey from higher level floors, which could become isolating without much employee traffic, and move the team to a main-floor crossroads of the campus. Encouraging employees to work in the space too or, at the very least, make it a regular pathway is intended to help leaders be more attuned to a broader context, learn about developments faster and be accessible for impromptu conversations with employees and visiting customers. The Steelcase executive team recently moved into its new Leadership Community. Like other Steelcase workplaces, it’s considered a behavioral prototype – a fully built-out environment where concepts can be tested and evaluated in actual use over time. Embedded technologies and observational research are yielding data and insights into how the space is being used and how it supports performance, building a growing repository of workplace knowledge. “Our research confirmed that no single setting can solve for the diversified needs of executives today. We realized the need to focus on a specific range of settings that are unrestricted by current conventions,” explains Kammer. Although these have been essential leadership activities for decades, in this latest iteration of Steelcase’s Leadership Community, discovery and learning are prioritized. As in previous Leadership Community iterations, the space design is predicated on the notion that leaders need to function as a team and should be located together when they are in the office, rather than being located with their teams and risking the creation of silos. In this newest iteration, the leadership space was intentionally built on the main floor, where employees pass through often. Employees are encouraged to use meeting areas within the Leadership Community, use individual workspaces and have informal, social gatherings there. It is radically more open to the entire organization than earlier iterations, sending a clear message to employees. This strategy reinforces behaviors found in complex adaptive systems, in which there is a free-flowing, naturally occurring exchange of information and ideas. In this new iteration of the Leadership Community, all senior leaders are collocated in a radically open-plan environment. Located on the main level, it is highly accessible to all employees. Instead of a private office, each resident executive, including CEO Jim Keane, has an open-plan workstation and shares access to enclosed private settings as needed. 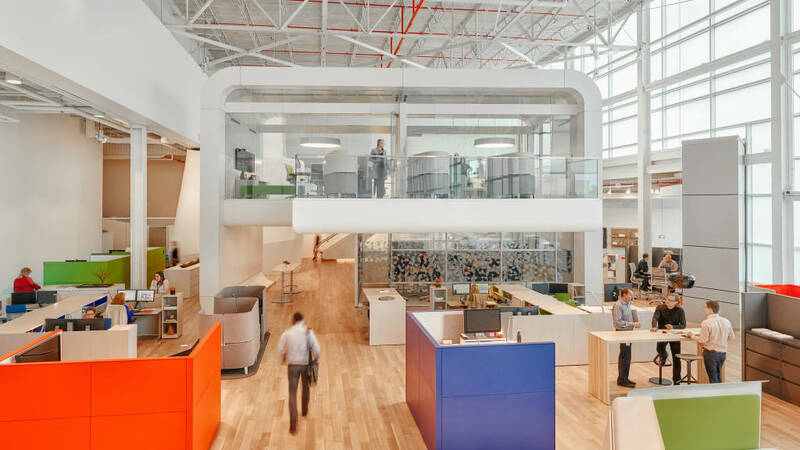 Steelcase leaders are highly mobile; their previous spaces were vacant up to 80 percent of the time, so the new space occupies only one-third of the real estate allocated to previous versions. “It’s intended to not only provide better ways for executives to work, but it’s also a better utilization of real estate.” says Barnhart-Hoffman. Leaders, like all employees, need spaces for privacy as well as socialization. They share access to a range of private, enclosed spaces that are designed for a variety of needs. They have places for entrusted, confidential discussions, rooms where they can work with sensitive information, or smaller enclaves where they simply step away and rejuvenate in solitude during a hectic day. 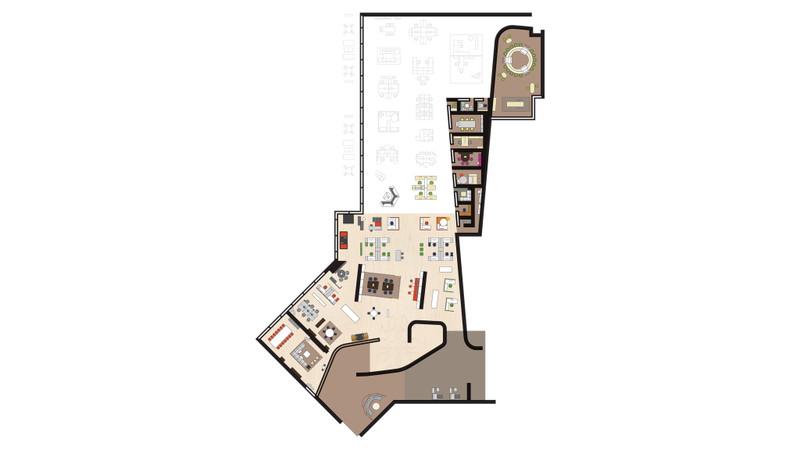 Among the innovative features of this latest Leadership Community design is the clustering of administrative assistants in the floor plan. No longer situated in front of the executives they support – and easily seen as a gatekeeper who controls access – they’re now in proximity to each other so they can share information easily and, like the executives they support, work better as a team. Because leaders are now located on the mainfloor in the center of the campus, they’re more accessible. Settings for impromptu conversations as well as scheduled meetings make it easy to stay connected and current. Steelcase is a global enterprise and the executive team is distributed across continents, regularly traveling between locations. The team is able to connect both physically and virtually in the office through immersive technology experiences that are integrated throughout the floor plan. What message does your space send about how leaders and the organization work together? Does it reflect the kind of organization you lead today, or the kind of organization you want to become? With its executive team spread across four countries on three continents, leveraging technology to achieve more immersive experiences was a vital requirement for Steelcase’s new Leadership Community space. Focused on learning, the team decided to use Cisco’s iRobot Ava 500 to explore ways remote team members can replicate the critical experience of being in the physical work environment. Gale Moutrey, vice president, global communications, is experimenting with a virtual presence device mounted on a mobile robot. Gale, who is based in Toronto, joins an impromptu meeting with colleagues while navigating through the Leadership Community. Gale Moutrey, vice president of global communications, is among the first to experiment. From anywhere in the world, thanks to advanced mapping and an easy-to-use remote control, Gale, who is based in Toronto, can move her robot in Grand Rapids, Mich., anywhere in the building to attend meetings or have hallway conversations as if she were actually present in the physical space. The mobile videoconferencing technology enables a more natural way to be with her executive peers and the teams she leads. Overall, she describes the experience as “liberating.” Even with the best technologies and exceptionally well-designed spaces, videoconferencing can limit the natural, seamless interactions that are crucial to effective teamwork and collaboration.